At age 19, H. Ross Workman was engaged to be married and not planning on serving a full-time mission. Then one Sunday morning his stake president walked up to him as he sat in his car and said, “I’ve been inspired to call you to go on a mission. Will you go?” Caught by surprise but feeling the confirming influence of the Holy Ghost, young Ross said, “Yes.” When he told his fiancée, the girl he had dated through high school and become engaged to on graduation day, she cried but agreed to support him and delay the wedding. The commitments made that day were a turning point in his life. He was born 31 December 1940 in Salt Lake City to Harley and Lucille Ramsey Workman. Following his mission to the southern states, he married Katherine Evelyn Meyers, his high school sweetheart, in the Logan Utah Temple. They are the parents of four children and have seven grandchildren. He earned degrees in chemistry and law from the University of Utah and has worked for more than 28 years as a patent attorney. 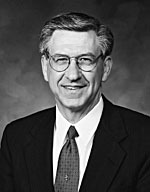 He worked with the youth for many years and has served in several bishoprics, on a stake high council, and as a bishop, and was president of the Hawaii Honolulu Mission when called to the Second Quorum of the Seventy. Elder Workman credits the leadership training he received while serving in a student ward bishopric as “giving me a vision of this work.” He looks back on his service as a bishop as one of the great experiences of his life. Among the successes he watched unfold as a mission president were the remarkable growth in faith of the missionaries and the establishment of the Church on Christmas Island in Kiribati, where the branch has grown to more than 114.